The annual Windsor butterfly count will be held on Saturday, July 7. See the count page for details. Friday, June 29: The Acadian Flycatcher seen at Ojibway has not been relocated but another (or the same?) individual was singing at Spring Garden Natural Area on June 18 (Fred Urie). Spring Garden also had a singing Yellow-breasted Chat on June 22 and 23 (Fred urie). Thursday, June 14: An Acadian Flycatcher is apparently on territory in Ojibway Park. This is the first time this species has been present in the park during the breeding season. A Yellow-throated Vireo sings each morning by the nature centre parking lot. 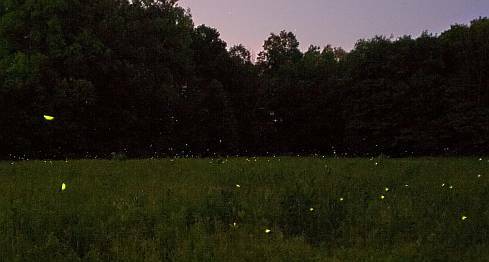 Fireflies are now common in the early evening, peaking in the first hour of darkness. The above photo was taken on June 12. Tuesday, June 5: A family of Groundhogs can be easily seen in the gardens by the centre's bird feeders. Up to five baby Groundhogs can be seen with a bit of patience. If you find a turtle wandering far from water at this time of year chances are it is looking for a sunny spot to lay eggs. Male and female Painted Turtles can be separated by the length of their front claws. Males have much longer claws on their front legs than on their rear legs. Females have the same size nails on all four limbs. The first fireflies of the summer where flashing over the prairie on June 3. Their numbers should increase steadily over the next two weeks.